Jade's mirrored cabinets will add a contemporary look to any bathroom. Mirrors have the ability to add brightness to a room, while also making it look and feel more spacious. Combine style with additional storage space and we have a winner! This mirror cabinet perfectly complements Jade's line of vanities and vanity sets, so be sure to shop the entire collection! The Semi-Circle vanity from JSG Oceana boasts a traditional style creating a timeless look of elegance. Fully functional in design, this bathroom furniture piece offers you abundant concealed storage; all 4 doors on this cabinet open up to shelving creating a solution for all of your storage needs. "Euro inch style hinges offer a soft-door close. A beige granite top and matching granite backsplash are included. Pair a JSG Oceana undermount and matching mirror to complete this classic look. A unique blend of natural woods artfully crafted in a mosaic pattern offers an exotic flair. Our Mosaic vanity base provides quality workmanship, ample storage and slow-close features. The doors feature natural-finish solid wood blocks in a tile pattern and are complimented with a dark chocolate finish cabinet and satin silver hardware. 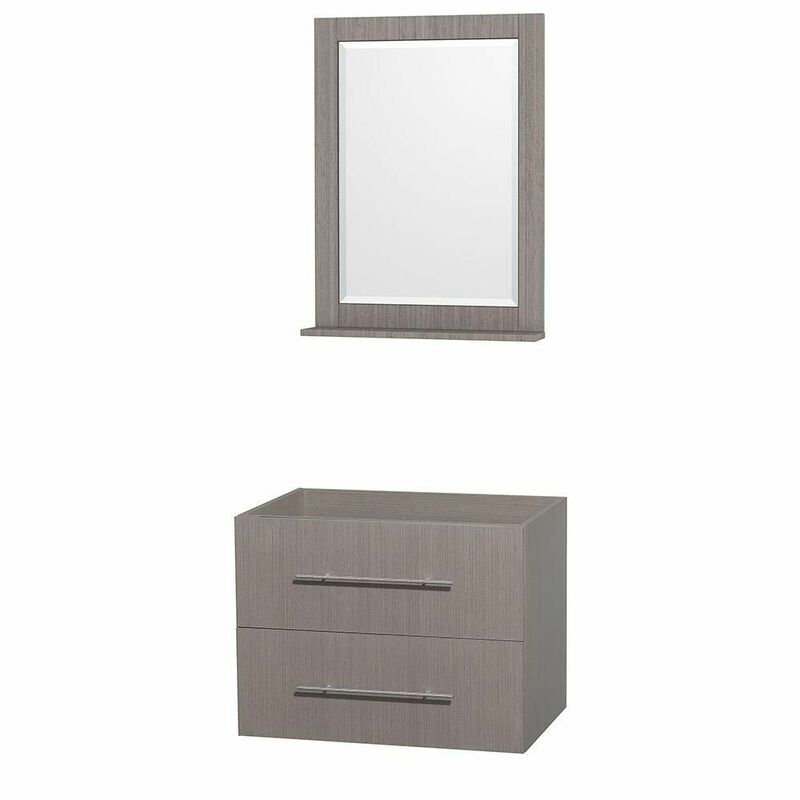 Centra 30-Inch Vanity Cabinet with Mirror in Grey Oak Simplicity and elegance combine in the perfect lines of the Centra vanity by the Wyndham Collection<sup></sup>. If cutting-edge contemporary design is your style then the Centra vanity is for you - modern, chic and built to last a lifetime. Featuring soft close door hinges, drawer glides, and meticulously finished with brushed chrome hardware. The attention to detail on this beautiful vanity is second to none. Available in several sizes and colors.